Although it would be nice to hatch our babies from eggs Anne Geddes-style, or deliver them while still tiny and carry them around in a pouch, humans and other placental mammals are stuck lugging their developing fetuses inside their bodies. Luckily, most humans aren't in danger of predation. But for animals that sometimes have to run (or swim) for their lives, pregnancy can be dangerous. In a punnily titled new study ("Pregnancy is a drag"), UC Santa Cruz researcher Shawn Noren investigates how pregnant dolphins are affected by carrying a wide load. Noren studied two captive bottlenose dolphins, each about 10 days away from giving birth, living in a lagoon in Hawaii. Though the study only included these two dolphins, Noren collected many data points by having a scuba diver sit underwater and videotape the dolphins swimming back and forth. The dolphins were also observed and recorded periodically during the two years after they gave birth. By digitizing these videos, the researchers could quantify the dolphins' size, mass, surface area, swimming speed, and swimming mechanics. As expected, very pregnant dolphins had a very much larger surface area. This created greater drag as the dolphins glided through the water. The dolphins also changed their swimming "gait," like a human who finds herself a little waddle-y in the final trimester. Dolphins get all their forward thrust from the up-and-down beats of their tails. The pregnant dolphins beat their tails a little more shallowly than usual, maybe because their muscles were stretched out and weakened by the fetus (or because their midsections were less flexible). Just like a human taking smaller steps, a dolphin making smaller tail-beats covers less distance. So the pregnant dolphins had to beat their tails faster to maintain a given speed. Besides experiencing greater drag and a shortened "stride," pregnant dolphins have altered blood flow and lower lung capacity. They also store more lipid (fat) than usual in their blubber, making them extra buoyant. All these factors combine to slow a dolphin way, way down. 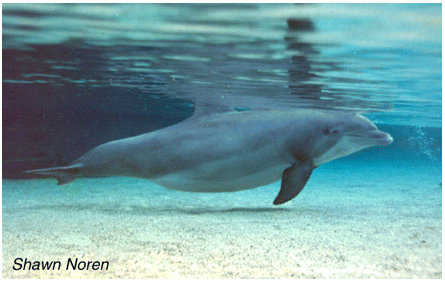 The two pregnant dolphins in the study swam more than 60% slower, on average, before their calves were born. After recovering from pregnancy, the dolphins' average swimming speed was around 9 mph. But before giving birth, their speed was closer to 3.5 mph--similar to the pace of a walking human. The crucial factor in avoiding predators such as sharks, though, is maximum speed. After pregnancy, the dolphins reached maximum swimming speeds of more than 14 mph. While heavily pregnant, they barely reached 8 mph. Of course, the researchers didn't introduce any sharks or killer whales into the lagoon to see how fast the dolphins could swim under real duress. But the researchers note that at the fastest swimming speeds they observed, pregnant dolphins would not have been able to out-swim most predators. It's unknown whether pregnant dolphins are more vulnerable to predators in the wild. But among ungulates--hoofed mammals such as buffalo or wildebeest, which happen to be close relatives of whales and dolphins--pregnancy is a known risk factor for being eaten by lions. In dolphins, the greater effort needed to swim while pregnant probably means they need to take in more calories. But it also must make hunting for food more difficult. A pregnant dolphin will have a harder time chasing after quick prey or, because of her increased buoyancy, diving to hunt. In humans, studies of how pregnancy affects walking have been inconclusive. This might be because there's a great deal of variation in how individuals' bodies adjust to pregnancy. These two dolphins, too, may not be representative of their whole species. But they demonstrate the amazing adaptability of a female mammal's body, whether she's diving for squid or just shuffling through the suburbs.